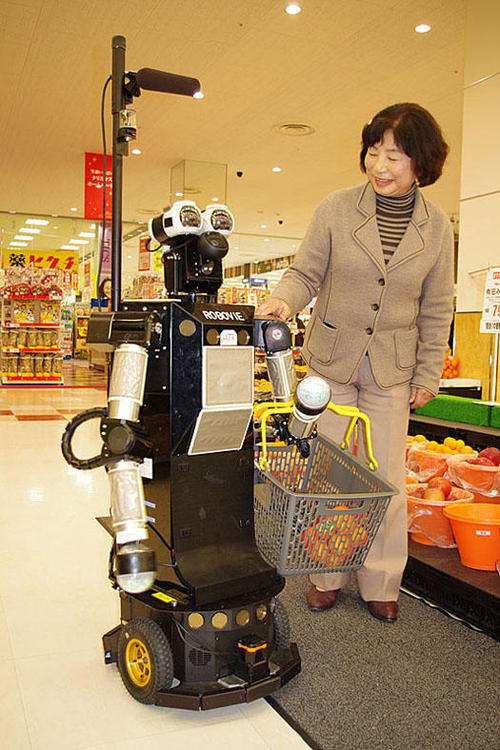 Japan will always find a way to build a robot for any seemingly simple human task—today’s example, grocery shopping. The Robovie II was designed to help the elderly go grocery shopping. Users enter their shopping lists into a mobile device that Robovie II senses and then syncs with upon entering the store. Robovie then follows the user throughout the store, helping them carry and remember what’s on their shopping list—kind of like a shopping cart that talks and has a memory. Robovie greets the user by name and exclaims “let’s start shopping,” but in Japanese. Let’s be honest, we would all love a robot to do our bidding for us. In the video clip the robot seems rather slow, but it could be just because it’s pausing to pose for the cameras—vain little android. Advanced Telecommunications Research Institute International (ATR) will be testing the experimental system at the Apita-Seikadai supermarket in Kyoto until March 2010.